Balaji Rubber Industries Pvt Ltd - Manufacturer and Exporter & Supplier of reclaim rubber to Majot Tyre, Tube, Rubber Moulded, Battery container & other rubber products. We wish to inform you that we are manufacturers of reclaimed rubber in India. 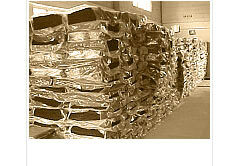 We produce & supply 1800 M.tons per month. We supply reclaim rubber to Majot Tyre, Tube, Rubber Moulded, Battery container & other rubber products manufacturers in India & around the world. Mfrs of reclaim rubber to Majot Tyre, Tube, Rubber Moulded, Battery container & other rubber products.